An Australian Christmas without pavlova doesn't feel like Christmas at all. Spread the pavlova mix on a baking tray in scoops with a spatula, pressing from the centre only to create a natural edge. Smooth the top. Heat your oven to 110C. Bake for 90 minutes, then allow the pavlova to cool completely in the oven with the door wedged open just a crack with a wooden spoon. For the topping, whip the cream and coconut essence (if using) to soft peaks, then fold through the coconut yoghurt. Top the pavlova with the cream mixture and lychees (reserving a little of the syrup for the mango sauce, if using tinned), and scatter with the coconut flakes. For the mango sauce, purée the mango together with the lime juice and a little of the reserved lychee liquid, if available. Pass the mixture through a sieve and refrigerate until ready to serve. Serve the pavlova with the mango sauce. 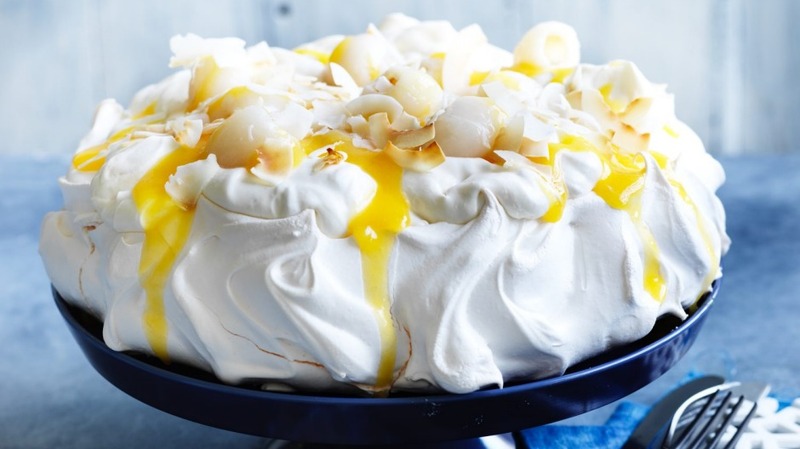 Adam's tip: The key to a strong pavlova is making sure the sugar is completely beaten into the meringue to strengthen the structure and avoid a collapsed interior. A bit of acidity from cream of tartar or vinegar also helps. For a tropical Christmas feast serve with Adam's tropical fruit glazed ham.